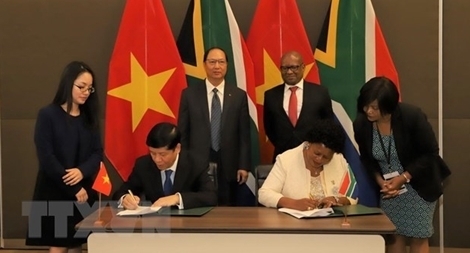 Vietnam and South Africa have agreed to work together to bolster comprehensive cooperation at the fourth Vietnam – South Africa inter-governmental partnership forum. PSNews – The Provincial Police Department of Quang Ninh and the Department of Foreign Relations of the Ministry Public Security (MPS) sign an agreement on cooperation in foreign affairs, international cooperation and human rights. "Work is ongoing to deceive us on the number of facilities, the number of weapons, the number of missiles," said one U.S. official. North Korea no longer poses a nuclear threat, nor is it the “biggest and most dangerous problem” for the United States, President Donald Trump said on Wednesday on his return from a summit in Singapore with North Korean leader Kim Jong Un. With EU budget commissioner Guenther Oettinger warning about spending cuts and increased budget payments by EU countries to fill the gap left by the UK’s withdrawal, Patrick Minford, a professor of applied economics at Cardiff University, told Radio Sputnik that time is running out for Brussels to ink a divorce deal with London. HCM City and Military telecom group Viettel on Friday signed an agreement to develop the southern metropolis into a smart city during 2017-2020. Vietnam and the Republic of Korea today (May 5) signed a memorandum of understanding that will serve as a foundation for enhancing worker safety cooperation in both countries and invigorate engagement in the global economy. Chief of the Cambodian People’s Party (CPP) cabinet Mam Sarin has proposed leaders of the Communist Party of Vietnam (CPV) and the CPP sign a new bilateral cooperation agreement for the 2017-2018 period.